Making your own liquid laundry detergent. Living on the Coast of Mississippi with 2 very active kids, a puppy and a husband, we do lots of outdoor activities. We play sports, ride bikes along Waveland Beach, go to the splash pad, play in the sand, swim at the pool and so on. With all of this come a lot of…….CLOTHES WASHING! Not where you thought I was going with this huh?! HA! Well, I have so many clothes, towels, swimsuits & various sports uniforms that pile up in my washroom. Because I wash clothes everyday, I used a massive amount of detergent. This can become quite costly. The light bulb went off! “Let’s make our OWN laundry soap” I told my husband with excitement! I figured it would save me money & the aggravation of having to haul home those heavy bottles from our local club store. I loaded my husband and kids in the car and headed out to the store. We were able to find everything at one store! woot woot! Items required to make washing detergent at home. Always wear eye protection and gloves when dealing with chemicals of any type. This is what we got! Once we were back at home, we immediately got to making the laundry soap. It took no time at all. Within 30 minutes, we had our first batch of detergent. I was so excited! I could not wait to use it! It worked just as well as any of the brand name soaps and was a fraction of the cost. It no longer pains me to fill that little measuring cup of liquid soap on a daily basis. Clothes washing detergent from water and 3 base products. By the way….you can get started on this for about $12! Yep…that’s all! The second batch of laundry soap and every batch after that will cost even less since you won’t have to buy the bucket again! Grate the whole bar of Fels Naptha soap. I used a regular box cheese grater. Put the grated soap bar in a pot of hot water and continue to heat on medium low until all soap chunks are dissolved. The soapy water will be a bit foamy. Fill the five gallon bucket half full with hot water. Pour in the hot soapy water mixture. Add 1 cup Super Washing Soda. 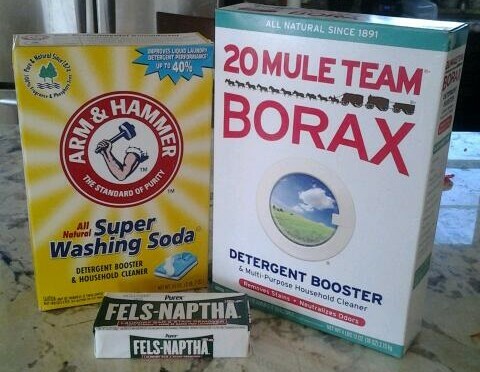 Add ½ cup Borax (I sometimes add as much as a cup). Stir that up. A long wooden paint stirrer works well. You can also use a paint stirrer that attaches to a power drill. Use whatever you have. Fill the bucket up to the top with more water. Give it another quick stir. Snap the lid on. The next day you can fill up your containers with the soap. I saved my old bottle of laundry detergent to fill, but you can use anything you wish (milk jugs, etc.). I leave the rest of the soap in the five gallon bucket until I am ready to transfer it.